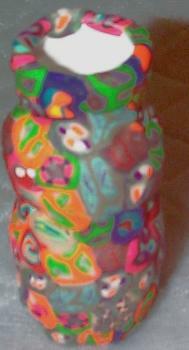 Chadis Crafts' Fun Pages - Clay Covered Yogurt Bottles. Polymer Clay can be baked on to many different materials: glass, wood, metal and some plastics. As part of my effort to recycle plastics and glass, I tried to cover a small plastic bottle that Dannon Yogurt now uses for its Drinkable Yogurts. I recently taught a class of 3 and 4 year olds. We made the little bottles into a mini vase/container. Give each child a piece of wax paper to work on for a clean surface. Also wash their hands before and after project to keep the project clean and to keep the chemicals off their hands afterwards. The children first softened the Sculpey by playing with it for awhile, keeping it on the wax surface. I try with preschoolers to only give one color at a time and repeat instructions often when they have more than one color. They then rolled many snakes. We then coiled them around the bottle. 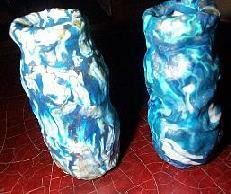 I rolled each bottle in my hand stretching the clay to about a 1/4 inch thick. When done and the bottle is covered including the bottom, use a tooth pick or pointed object to carve their name or initials. When you have older children the same project cane be done in a totally different look! Cane slices are gently pressed directly on the Yogurt Bottle. 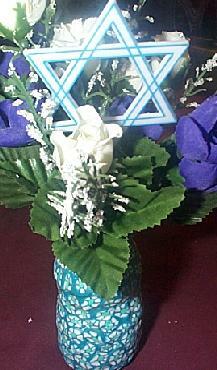 For the family party after my son's Bar Mitzvah we made our own center pieces. See my clay page for more clay ideas and lessons on how to make canes. 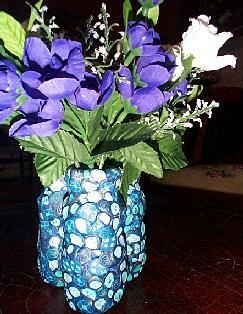 Also my baby food jar page for more recycling ideas.